unspoiled beaches and is this state’s most popular holiday destination. Whether you want to do the whole tourist thing or just chill out, whatever you’re looking for you’re bound to find it in ‘Coffs’. The place was originally named Korff’s Harbour by a John Korff, of course, in 1847, but the named was changed, by bad spelling I believe, by a crown surveyor in 1861 and by the early 1900’s the area had become an important timber production centre. 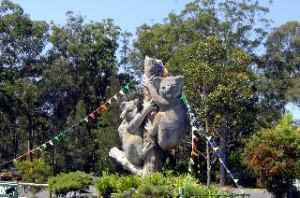 Today, Coffs Harbour’s industry is based on farming, most notably bananas, of which the hills are covered, and tourism. On a sparkling and very warm Friday afternoon, with our little dog, BJ, happily ensconced on the back seat, we set off for Coffs Harbour for some much-needed R&R with son, Rob, and his family. Where to stay was not a problem; the book “Holidaying With Dogs” has over 2000 listings of dog-friendly caravan parks in Australia and we settled on the Bonville Caravan Park ([star][star][star]) on the Pacific Highway at Bonville, about 15kilometres (9½ miles) south of Coffs Harbour We arrived at about 4:30 and the parks location caused a little concern; it’s right on the highway. But in spite of that it turned out to be reasonably quiet. The van sites, though few, are big and roomy; there was more than enough space for our van and Rob’s tent. The amenities are old but clean, the water hot and there’s plenty of it. So, with camp set up we settled back to enjoy a quiet and relaxing evening. Did I say quiet? Granddaughter, Sam, almost drove us crazy with her incessant chattering! is now closed and all that remains is the sign out the front. So what to do now? 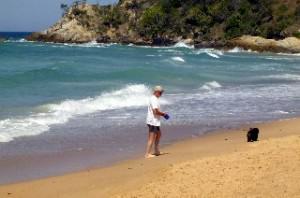 Well, when in Coffs Harbour, head for the beach! Sapphire Beach is a 2 kilometre (little over a mile) stretch of beach just north of Coffs Harbour and was all but de­serted when we arrived. There was a strong breeze blowing but that didn’t bother BJ. 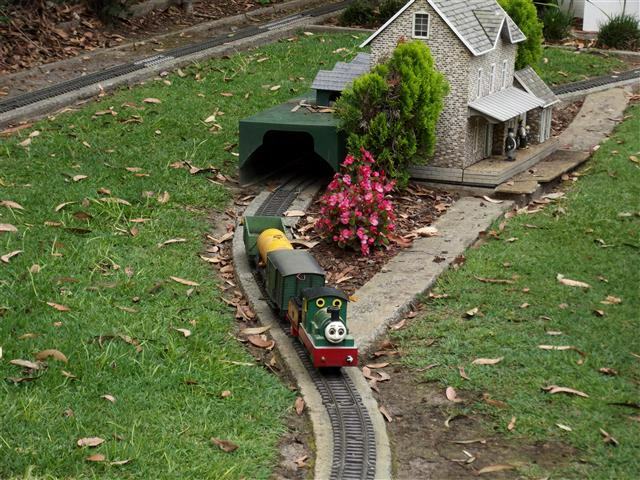 He ran, dug holes and rolled in the sand, and ran some more, as little dogs do, dragging John along with him. Sapphire is not a leash-free beach. But that didn’t worry this little black dog. The only problem, as far as BJ was concerned, was that wet stuff that kept chasing his feet! Sitting on the beach watching them play I couldn’t help thinking how beautiful it all is. The water, so clean and clear and the salt air so fresh, why would anyone ever want to leave? else in NSW, is a major attraction for divers. The marine park stretches about 75 kilometres (approximately 47 miles) from Muttonbird Island in the south to Plover Island in the north. The Solitary Islands are a small group of islands along the coast, inside the park. The diving environment here is unique as it is where two great ocean currents converge; the cool water from the Tasman Sea collides with warmer waters from the East Australian Current. The wind was blowing even harder now than it had been before and, by this time, BJ had had enough of trying to avoid the waves. I’ve never known a dog like him; simply will not get his feet wet in the surf! The family were hungry and it was time to go find some lunch. There are about 70 different places to eat in Coffs Harbour and, understandably, none of them are dog friendly. So a picnic was the order of the day. 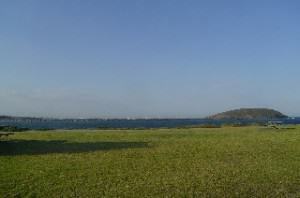 We stopped at a café for some sandwiches and drinks, and found a big shady tree in a park near the Coffs Harbour Jetty. Away from the water the wind wasn’t nearly as bad and we sat for a while and talked about what we would do this afternoon. After what was probably the barest minimum of discussion, mostly Sam insisting she needed ice cream, it was decided that we would pay a visit to the Clog Barn. took a stroll around a miniature Dutch village and saw miniature working windmills and a model railway in the gardens. 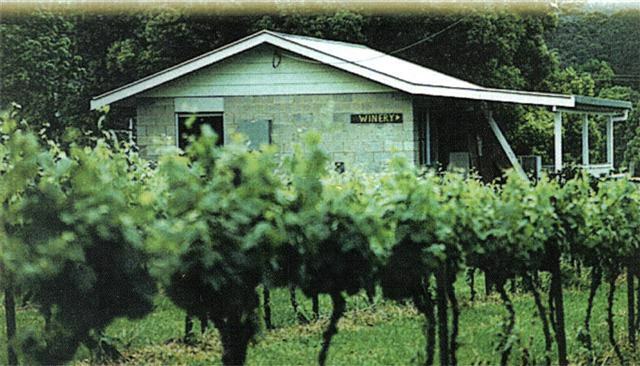 The business has been operating since the 1980’s and includes a caravan park. There are daily clog making demon­strations and the shop there sells a wide variety of clogs, even soft-soled ones, all made on the premises. John wanted to see Moonee Beach that afternoon, where there’s a long walk out over the sandbar before you actually reach the surf. It’s also dog friendly although, again, not leash-free. Moonee Beach has a camping reserve and caravan area that is very popular with families because of the shallow water; along the shore there are small pools where children were playing. I’m not sure if the tide was out but I suspected that it was; this area looks like it would be deeper at high tide. BJ and I went for a walk out to the surf but, again, he didn’t want to get his feet wet. When we had to walk through one pool to get to the other side he simply refused and dug his heels into the sand! Short of dragging him the only way to cross was to carry him! Who said he was spoilt? There were a few swimmers in the water but no one was surfing, there wasn’t much swell and, truthfully, today the waves were pitiful. Sam had found a children’s play area and she was in heaven, swings and things to climb on and slide down. The only problem there was going to be getting her to leave! Leaving Moonee Beach we stopped at the Coffs Harbour Jetty on our way back to camp. The Jetty Pier is quite a landmark. 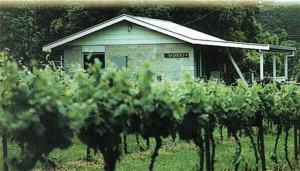 Originally built in 1892 it was completely rebuilt in 1997. From the pier you can fish, take a walk, or just enjoy the view out to Muttonbird Island and beyond. eagles and they breed there during the summer months. Sometimes you can see them but we weren’t that lucky this time. It is also a great place for whale watching. Every autumn and winter the whales head north to the warmer water for calving and then in spring head south again to their Antarctic feeding grounds, following the converging currents. Often they move very close to the coast and are frequently seen in the marine park. The sun was starting to go down and with it the temperature but there were still a few hardy souls braving the surf, such as it was, at Jetty Beach. Just watching them made me shiver! South of here is Boambee Beach where 4×4 driving is allowed and dogs can run leash-free. But it was getting dark so we gave it a miss, much to John’s disap­point­ment, and made our way back to camp. 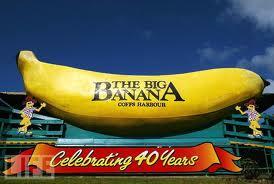 Harbour’s most recog­nisable attraction, the famous Big Banana. Set amidst banana plantations this theme park is a must-see and it was right in the middle of its 40thbirthday celebrations. 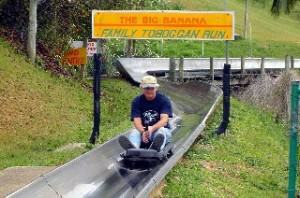 There are rides, plantation tours, souvenir shops, and a café specialising in all things banana. Having BJ with us limited what we could do here but not everything was a no-go. Adventure Trike Tours is tucked away in the caravan and coach parking area and as soon as John saw those three-wheeled motorbikes his eyes lit up! And when the fellow in the office told us we could take BJ, well there was no stopping him! John, that is, not BJ. There were, however, some rules. BJ was our responsibility, he had to wear a seatbelt and, as he was a passenger, we had to pay normal fare for him. No problem! This was going to be fun! And fun it was! We opted for only the short ride of about 7 or 8 minutes because we didn’t know how the dog would handle it; this would be interesting. But BJ sat between us and at first he held his head up with the breeze blowing into his face but after a while he put his head down onto John’s knee and, I swear, he went to sleep! So much for worrying about him! Meanwhile, we were having a blast! Our rider, Keith, was terrific. He took us up the Pacific Highway for a short way and then back towards town before coming back to the Big Banana and making a circuit of the parking areas. We waved at everyone and most folks waved back; those that didn’t were probably envious! 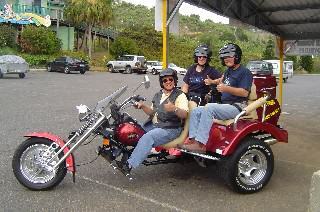 Adventure Trike Tours has mature riders who put your safety first and ensure that your ride is fun and exciting. I know we’ll be going back on our next visit to Coffs Harbour and then it’s going to be a longer ride! you can actually get up to quite a speed. That is, as long as there’s not a slower person in front of you. Each toboggan is fitted with a brake to slow you down, if need be. Well, the family had fun, in spades, and went back time after time for their rides. I elected myself official photographer and stayed well away from it all with BJ! By now I was ready for a coffee. The café has all manner of different coffees as well as banana-oriented snacks and BJ was allowed to sit at the outside tables with us. After coffee I took him for a walk, as all little doggies need to do from time to time, while John and the family visited the candy shop to watch rock candy being made and to have some free samples. As you do. 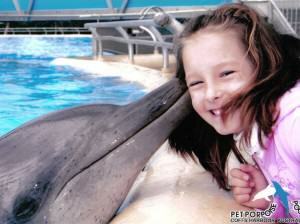 people a “hands-on” experience with all sorts of marine animals, especially dolphins. Opened in December 1969 with one dolphin, the collection of animals soon started to grow with various rescued animals and some from other marine parks. Today Dolphin Marine Magic has the largest colony of Australian sea lions, several dolphins, and a variety of other marine animals and is one of only two such facilities in Australia. So, after dropping BJ at the pet sitter’s (Pettina Park Pet Motel) for a couple of hours we set off for the Pet Porpoise Pool. The show was great and every visitor to this park has the opportunity to get a kiss from a dolphin and to have their photo taken. Sam was not going to leave without that and so, after much pleading and beg­ging and promises of being good forever, her father said yes and she posed with her new friend. tracks for home. We’d had a wonderful couple of days and it was with some reluctance that we bid farewell to Coffs Harbour; we could quite easily have stayed for a week. There is any number of things to do in Coffs Harbour and we’ve only made mention of a few here; to list them all wouldn’t be practical. Suffice to say that a minimum of two weeks would be needed to do it justice and even then you wouldn’t see and do everything. But for a short break to recharge the batteries, a weekend is just what the doctor ordered, so to speak. Holiday times it is extremely busy but whether your tastes run to five star hotels or a tent on the riverbank, Coffs Harbour is sure to please.